With a pedigree that includes novelist Stephen King (playwright), rocker John Mellencamp (music), Academy Award and Grammy Award-winning producer T-Bone Burnett (musical director) and director Susan V. Booth, Ghost Brothers of Darkland County is one of the most anticipated local productions in recent memory. The musical, which features original music by Mellencamp and a bluesy, roots-tinged score, is also one of the longest-awaited productions in the history of the Tony Award-winning Alliance Theatre, where it makes its world premiere on April 4. King and Mellencamp first started discussing the project more than a decade ago. After an aborted attempt at staging the show in New York, Ghost Brothers was slated to bow during the Alliance’s 2008-2009 season but was postponed. The production, which closes out the Alliance’s 2011-2012 season, features a healthy mix of local and national names, with more than a third of the cast hailing from the area. Atlanta faces including Joe Knezevich, Rob Lawhon and singer Gwen Hughes share the stage with Tony Award-winner Shuler Hensley (Young Frankenstein, Oklahoma! ), a Marietta resident and Atlanta native, and Columbus, Ga. native Justin Guarini (American Idol). Among the other notables in the cast are country musician Dale Watson, blues musician and actor Jake La Botz and Tony nominee Emily Skinner. As one would expect from King, Ghost Brothers is a ghost story, a “Southern Gothic” tale that the playwright feels is a perfect fit for a Southern theater. A three-CD recording of Ghost Brothers, produced by Burnett with a cast including Kris Kristofferson, Elvis Costello, Rosanne Cash, Neko Case, Dave Alvin, Sheryl Crow, Mellencamp and King, among others, is scheduled for release May 22. 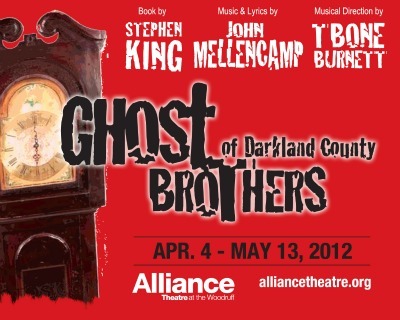 Ghost Brothers of Darkland County runs April 4– May 13 at the Alliance Theatre. 404-733-5000. www.alliancetheatre.org.